Several people in next to the sulfur fountain located at the park between the Plant Investment Company (PICO) office and the South Florida Railroad station, located at 209 North Oak Avenue in Sanford, Florida. This photograph was taken during the Freeze of 1898. Original 8.5 inch x 5.25 inch black and white photograph: Sanford Museum, Sanford, Florida. Digital reproduction of original 8.5 inch x 5.25 inch black and white photograph. Sanford Collection, Seminole County Collection, RICHES of Central Florida. Copyright to this resource is held by the Sanford Museum and is provided here by RICHES of Central Florida for educational purposes only. The Seminole Herald. Sanford: Our First 125 Years. [Sanford, FL]: The Herald, 2002. "Sanford: A Brief History." City of Sanford. http://www.sanfordfl.gov/index.aspx?page=48. Brochure, Sanford: Central Florida's Waterfront Gateway. Sanford, Florida: City of Sanford, 2005. Big freeze of 90--The sulpher fountain in the little[?] "park" between Pico and station. 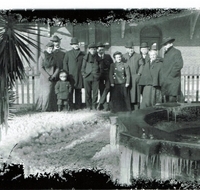 “Railroad Fountain During the Freeze of 1898.” RICHES of Central Florida accessed April 23, 2019, https://richesmi.cah.ucf.edu/omeka/items/show/4231.